It’s the 1950s and the standard idea of a family was a husband and wife, married for life with a couple kids and a house in the suburbs. That was life for one woman; she raised the couples’ kids and supported her husband through grad-school. But, the honey moon didn’t last forever, and after she began working again once the kids were in high school, her husband left her for a younger woman. The former wife was left with little income and meager savings. That’s why opponents of alimony reform like Barbara DeVane think Governor Scott did the right thing by vetoing the reform. “They’re not taking into consideration older woman who have either given up their careers or never had a career to start with and they’ve stayed at home and raised the children, supported their husbands as he advanced in his career and then she gets older and he wants to trade her in for a younger model,” DeVane said. Supporters say the reform bill updates an outdated system that unfairly punishes some people and ensures more equitable outcomes. 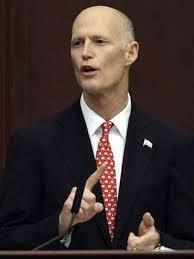 But, Governor Scott said he vetoed the bill because of its retroactive clause, allowing the renegotiation of contracts. Scott says that wouldn’t be fair to Floridians. “I think you look at everything based on your own experiences, but you try to listen. I got a lot of feedback from a lot of people and tried to make the right decision for 19.2 million people,” Scott said. Reform supporters say they didn’t expect Scott to veto the measure and suspected it might’ve been for political reasons. Alan Frischer with the Florida Alimony Reform Group said they’ll be back with another bill next session. “I was hopeful that he would you know, let this pass, but he chose not to, for possibly some political reasons but also because he distinctly felt that the retroactivity part was not appropriate. So, hopefully we’ll be able to come back next session, revise our bill, and bring it back to Governor Scott for his signature,” Frischer vowed. But, Republican Representative Ritch Workman, who sponsored the House version of the alimony measure, doesn’t think all hope for passing reform is lost. He’s filed it, minus the retroactivity, as an amendment to another bill. “It’s a hail Mary pass that may or may not get a chance. When I filed the amendment there were two days left and now there’s one in a half days, less than one in a half days left. So, a lot of things can happen the bills have been heard so it’s nothing new to the chambers. It can turn very quickly and it very well might, but I’m not a gambling man so I won’t put odds on it,” Workman said. With only one full day left in session, it’s unlikely that alimony reform will pass this time around. But, supporters of reform say they’re undeterred and will return more energized in 2014. The Florida House ended a second day of political wrangling between Democrats and Republicans with neither side smiling at the end. Democrats continued their protest of the House Majority’s refusal to take up a bill accepting $51 billion in federal Medicaid money to expand insurance coverage to an additional one million low-income Floridians. The chamber continued reading bills aloud word-for-word with the computer software “Mary” the House’s Auto Reader who, in two days, has become a breakout star with more than 614 followers on twitter since arriving to the site…Tuesday.